Aren’t budgets all about money? Don’t they track how many $$$ come in and how many $$$ go out? That’s right; so what’s a carbon budget? A carbon budget tracks how much carbon, C, goes in and out of a natural area. Right now, we’re worried about too much C going into our planet’s atmosphere. This excess C is causing global warming, sea level rise, ocean acidification and other environmental problems. These are BIG problems! We can begin to fix these problems if we do a carbon budget and really know how much carbon is where. Imagine your money budget. Let’s say we track your $$$ in and out of 4 categories. Money comes into your pocket from 2 categories, mowing the neighbor’s lawn and babysitting. Money goes out when you pay for movies and snacks. In the same way, scientists want to track C as it moves between the coastal water “pocket” and 4 nearby areas: the coastal land, the atmosphere above, seafloor below, and the deeper ocean offshore. Where is C leaving the coastal water? Where is it entering? But wait! Coastal zones are only small slivers of water, compared to the open ocean around the world. 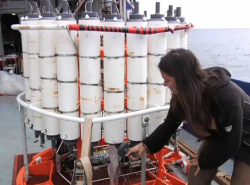 Why bother to track carbon in coastal waters? Ah ha! Coastal waters are very important in C budgeting. Notice the red color in the map above. Red means there's a lot of chlorophyll. Chlorophyll is the green pigment important in photosynthesis, the process that plants use to take in C and fix it as sugar. 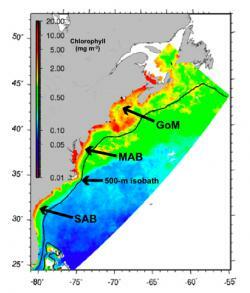 The red in the map shows that coastal waters are richer in carbon than the open ocean. Understanding the C budget of coastal waters is one small but important step in solving global warming and other environmental problems. Reference: Ocean Carbon & Biogeochemistry Winter 2010 OCB Newsletter; Vol. 3, No. 1.